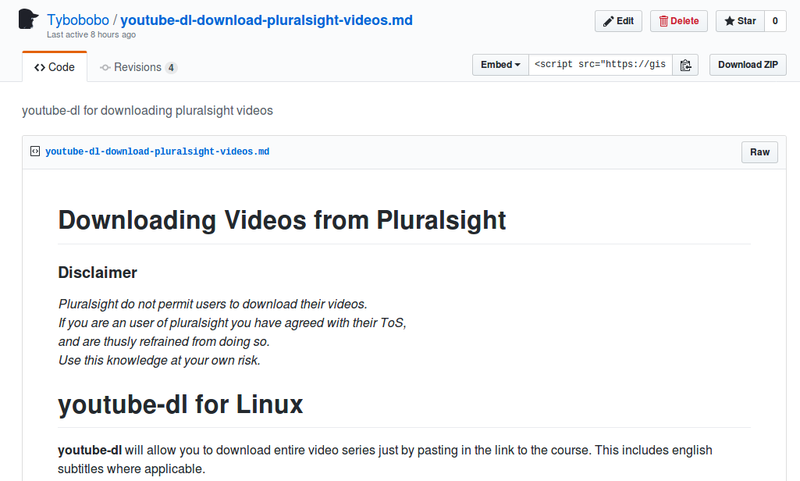 Keep in mind that Pluralsight does not give their users permission to download their videos. This is for educational purposes only. Use this knowledge at your own risk. Someone asked me if I had any ideas of how they could download videos from Pluralsight. Not just one or two videos, but entire courses. As the geek I am, I accepted the challenge to find a way. Luck have it; someone else have already done most of the work for me, by creating youtube-dl. The result of my research led me to create this gist page. In that note I explain how you can setup an automated way to download one or more courses (yes, entire courses) with just one terminal command. Note that this was intended for Linux users. If I get a lot of requests, I might write something equivalent for Windows users. That is pretty neat! Although because of the way they do business, it does not seem worth it. At least not to me personally. I can see that the user friendliness might make it worth it for others though, so I will give them that. Frankly, $12 for “500 Download credits” is a almost a scam – when there are free alternatives such as youtube-dl. If you could purchase it once (no limitations of use), then it would certainly be something to consider – even for a steeper price. Allavsoft is a much easier method to download videos from Pluralsight, Lynda, Udemy etc.